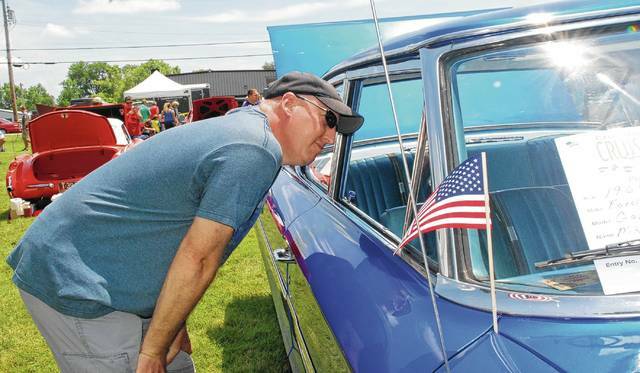 Chris Snyder of Dayton peeks into the window of a 1964 Galaxie 500 during the 20th Annual Champaign Cruisers Firecracker Car, Truck and Bike Show near the Urbana airport on Tuesday. Each year the Cruisers host the show to raise money for local causes. The Galaxie 500 is owned by Mike Purtee. In addition to the car show, fireworks, a concert and a chicken barbecue were also part of the big event at Grimes Field for July 4.
https://www.urbanacitizen.com/wp-content/uploads/sites/36/2017/07/web1_car-show.jpgChris Snyder of Dayton peeks into the window of a 1964 Galaxie 500 during the 20th Annual Champaign Cruisers Firecracker Car, Truck and Bike Show near the Urbana airport on Tuesday. Each year the Cruisers host the show to raise money for local causes. The Galaxie 500 is owned by Mike Purtee. In addition to the car show, fireworks, a concert and a chicken barbecue were also part of the big event at Grimes Field for July 4.